If you haven’t heard of yoga before, then you probably haven’t left your house or had internet connection for about ten years. I would bet most people have heard the word before, even if they have no idea what it means. Some people may even know it has something to do with stretching or the way you breathe. Despite the fact that I am writing this post, I am not a yogi. I enjoy yoga, I wish I was a yogi, I definitely aspire to be, but I am a novice practicer who cannot touch her toes as well, just as I suspect you may be if you’ve clicked on this link. I won’t bore you with the details (that’s between me and my therapist), but basically, I let life get in the way of really going for the full head stand, and then let myself get in the way from doing yoga to make it all better. The irony is that yoga would help with why I am skipping yoga. But you aren’t here for that- you’re here for the personal lessons I have gained from all my experiences with yoga. Below you will find all the benefits and some tips for how to start getting into it, because you may not realize it yet, but you love yoga. I feel like I do not really have to explain this one, but I will anyway. Yoga includes a lot of stretching, which naturally increases a person’s flexibility. However, it does a little more than just regular stretching will. Yoga has you focus on your breathing above all else, and when you breathe properly into a stretch, it really does make a difference. Correct breathing will help you go just a little bit further each time, until downward-facing dog is slightly less torture and slightly more about the free movement. This one surprised me. When I first stepped foot in a yoga class, I was in a very judgmental headspace. I hated the class, and said I would rather be strength training because yoga wasn’t going to get me anywhere. Now, three years later, I would honestly pay to see some strength trainers hold the poses a level one yoga class puts you into. I do not need to do hot yoga to sweat, that’s for sure. The poses can be a workout, and as you hold them begging the instructor to allow you to release your muscles from their torture, you realize that you are building strength in ways and in areas you didn’t even know existed. No, I am not kidding. A lot of poses in yoga serve specific purposes related directly to things going on within your organs, and digestive fixes are a common benefit of the most basic and complicated poses alike. You probably don’t even realize the benefits each of these poses is doing to detox the horrible things from your body, at least until afterwards when you get home to your own restroom. Almost more important, and more of a direct focus of most yoga practices, are the mental benefits of yoga. I will list those down below, but for those of you who want to use yoga to aid certain things in your body, I highly recommend checking out the book Yoga Cures by Tara Stiles. It was one of the first yoga books I picked up, mostly because I really wanted something to help with my migraines. Just like any workout, yoga can help you feel way more energetic. However, the increased energy goes beyond just the afterglow of endorphins. Practicing yoga can help you get better-quality sleep. I tend to be a night-owl, I hate going to bed before midnight, and yet on a day I have done yoga, I find it easier to rest in my own bed, and I wake up a lot more refreshed than I would have otherwise. I think it personally has to do with working the mind and body together to reach a kind of homeostasis, but that’s just my personal explanation. I suffer from anxiety and depression, and can sometimes sink into mindless negative loops in my life. I speak from experience when I say that yoga helps with this. Not only does it help even out my hormones, but the meditation in class eases whatever anxious thoughts are clouding my brain at the time. I am not saying that yoga can treat severe mental disorders, you should always seek help if you think there’s even a possibility of something like that effecting your life, but it can help ease the symptoms a bit. I’m sure you’ve heard the word- mindfulness. It seems like it’s everywhere these days, just like the word yoga, with people telling you to focus on your light and meditate for just five minutes every day to change your life. Well guess what? They’re right. When you become more mindful, you are able to control your reactions to the world around you so much easier. Personally, when I meditate and do yoga regularly, my everyday stress is almost non-existent. When you gain the ability to separate yourself from the emotions you feel, your whole world really does change. Once you can separate yourself from your emotions, you can pinpoint negative thoughts and stop yourself from thinking them, which allows you to think more positively, and when you think more positively, you attract great things into your life. 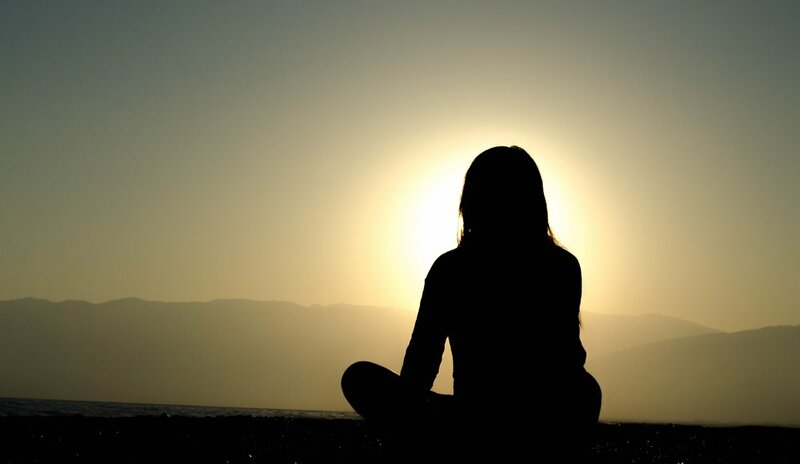 The law of attraction is a whole other blog post I will do another day, but it is all connected, and it all starts with sitting quietly in a safe space and focusing on your breathing. I am not a yoga instructor. I am not going to put poses into this post, and I am not going to tell you what level you should start at, because every single one of us is different. I started out hating yoga, thinking it was a fad that would fade into nothing and die out. Now I believe that, outside of hiking, it may be my favorite type of workout. I know that it is intimidating to try something new. Trust me, I know. The first time I went to a yoga class that I took seriously, I was terrified. My anxiety was imagining every worse case scenario, some of which included falling or having gas, or looking like what I was- a beginner. Readers, this is very important- if you are new to yoga, please go to a beginner’s class first. I know some classes can be expensive, and you may feel more comfortable at home, but for the sake of your mind and body, please go get some real instruction AT LEAST once before trying anything at home. It is not as bad as it seems, I promise you. Also, if you want to go to classes, but haven’t found an instructor you love yet, that’s okay. It took me a few tries to find my favorite (her name is Kelly). You need to be comfortable with the person guiding you, and everyone has his or her own style. You’ll find yours. Wash your feet. Yoga mats pick up dirt from your feet so easily! Eat at least an hour before, and not something you know upsets your stomach. Bring a water bottle, drink a bit and use the restroom before you start. Dress comfortably, but keep in mind if you wear a shirt that is too loose, it may fall over your chest when you do inverted poses. Tell your teacher if you have any injuries, so they can adjust some poses in a way that won’t hurt you. If you think there’s no way you can do a pose, trust your teacher, and your body. Ask for help; it is worse to do a pose wrong and risk hurting yourself than it is to risk your pride asking for assistance. Also, almost every pose has a supported version that is much easier to maintain as you work your way up. That’s it, readers. I know this post is long, but I really wanted to share everything I could with you, so you understand all the benefits surrounding yoga and know what to expect. Every new thing takes time, so go in with an open mind and body, and you never know- one day I may stumble into a class with you in it! Also, if you have more yoga advice, please comment it down below- I always love more information on the subject too!